Fresh off a breakout season in which he posted career-bests in nearly every statistical category, Los Angeles Dodgers infielder Max Muncy was the recipient of the 2018 Texas Professional Player of the Year Award. Presenting the hardware to Muncy was none other than former Dodgers third base coach and current Texas Rangers manager Chris Woodward. 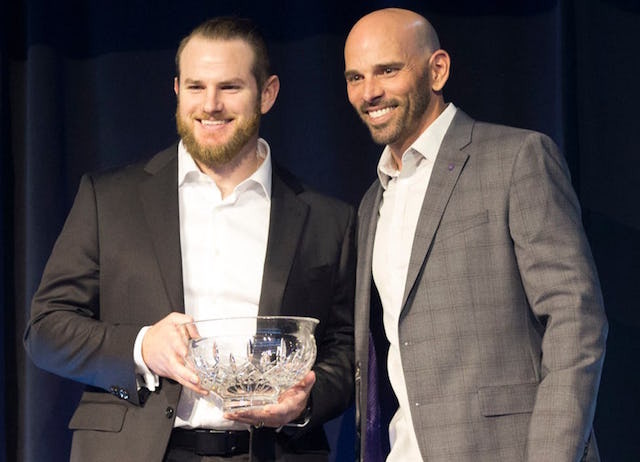 The Midland native was recently on hand at the 2019 Dr. Pepper Texas Rangers Awards Dinner to accept the honor. With injuries plaguing the Dodgers early on during the 2018 season, Muncy earned a promotion to the Majors in mid-April and never looked back from there. He bounced back from a slow start in April with a tremendous offensive showing the following month. Appearing in 74 games, Muncy hit an incredible .271/.409/.604 with nine doubles, 22 home runs and 41 RBI over 279 plate appearances in the first half of the season. Despite that performance, he fell just short of being selected to the National League All-Star team. Muncy still went on to participate in his first career Home Run Derby at Nationals Park. 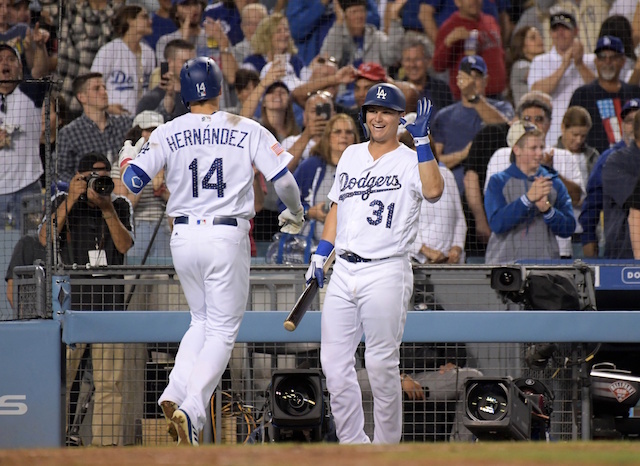 The 28-year-old defeated the Chicago Cubs’ Javier Baez with 17 homers in the first round before being eliminated by the eventual winner and hometown hero, Bryce Harper. Muncy picked up where he left off in the second half, posting a .919 on-base plus slugging behind 23 more extra-base hits and 38 RBI across 202 trips to the plate (63 appearances). He finished the season with an overall slash line of .263/.391/.582 in 481 opportunities (137 games). Muncy accumulated 4.2 WAR (Baseball-Reference) for his efforts and appeared at four different positions over the course of the year. Muncy capped off his incredible 2018 campaign with one of the most memorable moments in postseason history. Facing Boston Red Sox right-hander Nathan Eovaldi, he slugged a walk-off home run in the 18th inning of Game 3 of the World Series to give the Dodgers their only win of the matchup.